Website visitors are becoming increasingly demanding when it comes to design quality, with research showing a website has 10 seconds to make a good impression before they leave. SiteDesigner is an online website builder that enables you to create, manage and host your website all from the same package SiteDesigner allows anyone to design and publish a website they can be proud of without any technical knowledge. SiteDesigner is also a perfect framework for web designers and agencies who need to build great looking websites quickly and easily. Advanced tools such as direct access to the CSS 3 and HTML 5 code mean you can fine tune your designs to your exact specifications. Why use an online website builder? Whenever we upgrade our software you are automatically moved over to the new version. Change colours and fonts at the touch of a button, and adding text, pictures, music and video is as easy as drag and drop. Enrich your website with social media features, maps, contact forms and ecommerce functionality. Hosting is included so there is no need to buy additional packages to make your website accessible to the world. Easy to get started with if you are a beginner and powerful enough to scale if you are a seasoned designer, SiteDesigner's built-in design tools allow anyone to create completely unique sites. SiteDesigner comes with all the features and support you'll need to build a great looking website you can be proud of. Choose the package right for your needs. Can I set up an online shop? Ecommerce is available the Pro package. You can use our Google Checkout Widgets or you can embed another ecommerce platform into your site (such as Paypal). Can I add adverts to my website? I want to show my images ‐ Do you have a gallery? Yes, we have a Carousel Widget, which lets you create a sequence of images or other elements. I already have a site. Can I import it into SiteDesigner? No you cannot import a site into SiteDesigner, but you can easily recreate it. Can I upload my own videos to my SiteDesigner site? You can upload videos up to 20mb. If your video is bigger than this, we recommend you use a video hosting service like YouTube or Vimeo and embed it. You can create and publish one website per package. 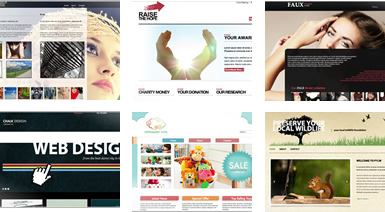 If you want multiple websites you will have to buy additional SiteDesigner packages. Do SiteDesigner sites have good Search Engine Optimisation (SEO) performance? All websites are built in HTML and CSS, rather than Flash, which means they are naturally search engine friendly. For users who want to get more advanced with SEO, you can edit page titles, meta descriptions, add contextual links and much more.